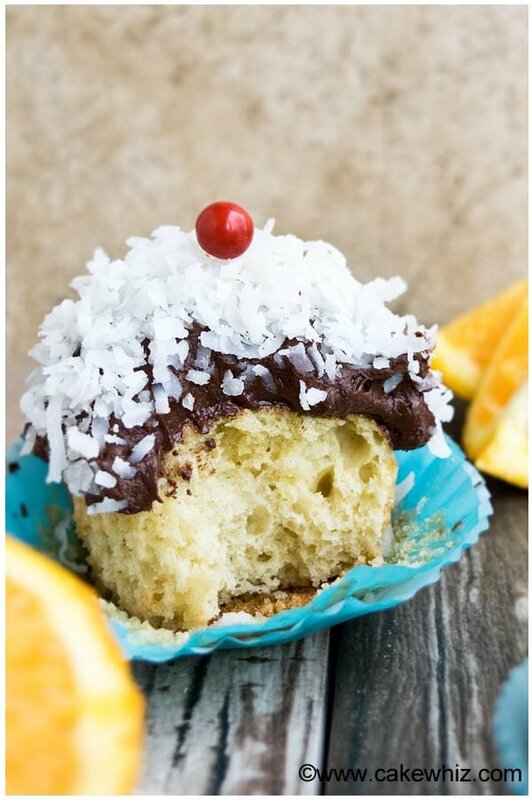 These low fat coconut orange cupcakes with healthy chocolate frosting are perfect for Summer time. Great low fat cupcake recipe for people on diets! To get over the Winter gloominess, I made these low fat coconut orange cupcakes. Even though we are smack dab in the middle of winter, that shouldn’t stop any of us from bringing a bit of CITRUSSY sunshine into our snacks and desserts…hehe. Now, I know many of you have New Year’s Resolutions and you are watching what you eat and making better diet choices. Well, I promise you can eat these cupcakes WITHOUT all the guilt of eating one of my usual cupcakes…haha. I have REDUCED the fat content in these cupcakes by using Silk vanilla yogurt and Silk unsweetened vanilla almond milk and both of them have NO cholesterol and are are low in saturated fats! 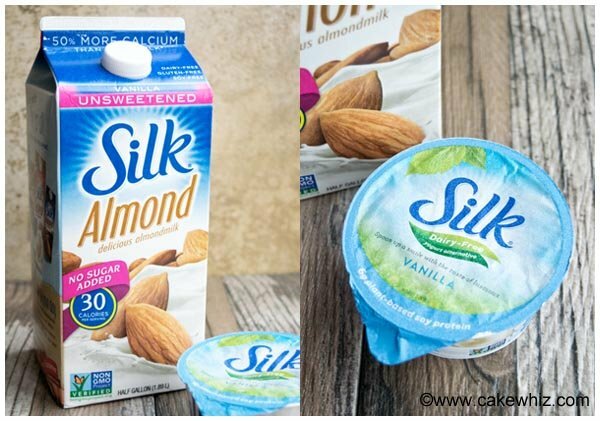 They are made with the goodness of plants instead of dairy and taste sooo good! Can you believe it’s made with only THREE ingredients?! Plus, it has NO butter, shortening or even powdered sugar! It’s so RICH and CREAMY that I kept licking my spatula while frosting these cupcakes…lol! To really ENHANCE the orange flavor in these cupcakes, I used a combination of orange juice, orange emulsion oil and orange zest. That’s THREE sources of orangey awesomeness! If you don’t have orange emulsion oil, you can use orange extract OR increase the quantity of orange zest. Add the egg and coconut oil in a deep bowl and mix until properly blended. Add yogurt, orange juice, orange zest, vanilla extract, orange extract and mix until you have a smooth mixture. In another bowl, whisk together the flour, sugar, shredded coconut, baking powder and baking soda. Dump this dry mixture into the wet mixture and mix until just blended. The batter will be thick. Please DON’T over-mix or else you will have a glutonous mess… There will be some lumps. Don’t worry about them! Pour the batter into 12 cupcake liners. You can push a few chocolate chips into these cupcakes, if you like. Bake at 350 degrees for 18-20 minutes or until an inserted toothpick comes out clean. While the cupcakes are baking, melt the chocolate chips and coconut oil in a microwavable bowl. Stir in the milk and mix until you have a smooth and glossy mixture. Chill this mixture in the fridge for 35-45 minutes until it firms up a bit. Then, whip this frosting in a mixer until it becomes light and fluffy. 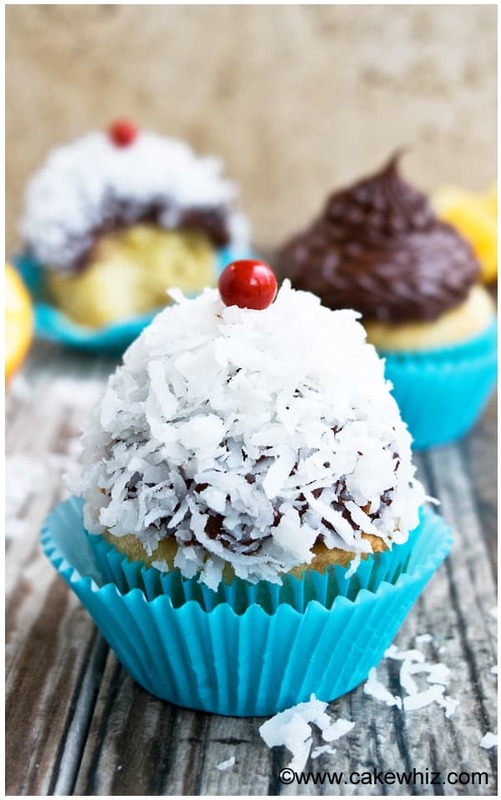 Frost your cupcakes and toss some shredded coconut and top it all off with a red candy. Enjoy! This cake batter will be thick and it will have some lumps. Don’t over-mix and try to get rid of them or else you will end up with very tough cupcakes! 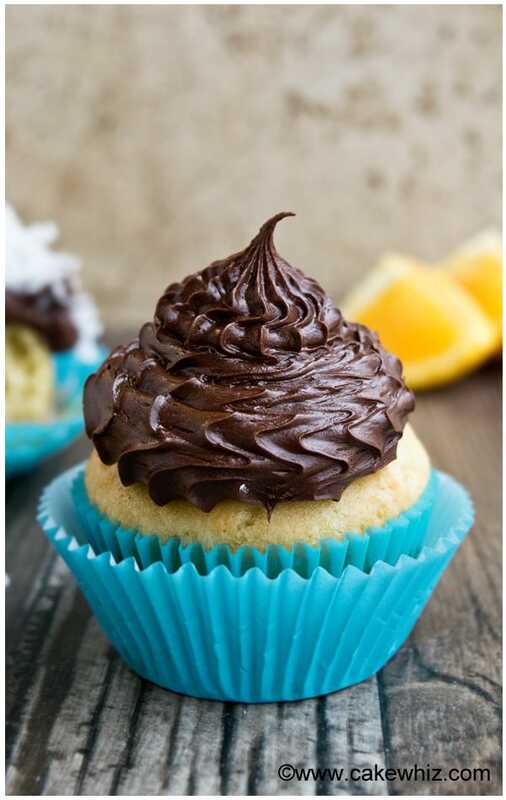 I love using orange emulsion oil in these cupcakes because it really enhances the citrussy flavor. Orange extracts have a milder flavor than emulsion oil. If you don’t have either, just increase the quantity of orange zest to 2 tablespoons and your cupcakes would still be very tasty. 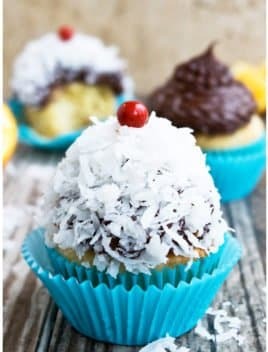 If you want to skip the frosting, you can just toss come chocolate chips on top of the cupcakes prior to baking or even stir some mini chocolate chips into the cake batter. These cupcakes looks like a dream! I love these flavors! And that they’re low fat! Definitely a must make!